Step up to the all-new PLAY:5; the powerfully smart speaker that fine-tunes its sound to bring you all the energy and emotion the artist packed into the original recording. Music thats pure, ferocious, tasty and true. Every detail of the PLAY:5 has been meticulously engineered to make streaming your favorite songs simpler, more immersive and more satisfying. So you can connect with the music you love on a whole deeper level. The PLAY:5 connects you directly to the heartbeat of the music you love. Flawlessly. Transparently. Truthfully. Three smartly synchronized mid-woofers team up with a trio of tweeters to treat your ears to the most remarkably distinct separation of voices and instruments they've ever experienced. You'll hear-and feel-all the emotion, energy and meaning the artist packed into the original recording. And connect with the music you love on a whole deeper level. Thoughfully designed, with tomorrow in mind. 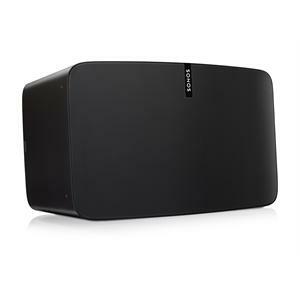 The PLAY:5 is meticulously engineered with an eye toward the future of home audio. Every detail-inside and out- has been carefully considered and expertly rendered to be immensely relevant today, and imminently compatible with tomorrow. It combines elegantly restrained good looks with agile internal sensors and ongoing software updates to provide your home with the most future-proofed audio solution currently available. So you can enjoy the purest expression of the music you love, now and for years to come. Acoustically aware and relentlessly adaptive, the PLAY:5 uses revolutionary TRUEPLAY tuning to analyze the unique acoustic dynamics of any space in your home, then fine-tune all six drivers for a listening experience thats true to the music and right for that room. Pair it with a second PLAY:5-each speaker will intelligently sense its orientation, then adjust its output to deliver a sweet spot thats wider in horizontal mode, or more focused and intense when positioned vertically.